To remain competitive on the nation’s largest retail holiday, several major chains opened their doors this afternoon for Black Friday 2015, launching a record-breaking 364-day parade of sales, deals, and riots. Chains including Walmart, Target, Kohl’s, Old Navy, Best Buy, and Macy’s are advertising doorbuster deals on dozens of items projected to be in vogue on the November 27, 2015 holiday. Despite the widespread excitement for the expanded opportunities for deals only slightly worse than those available every day on Amazon, millions of participating chains’ retail employees have been reluctant to accept the early starts. None were available for comment due to both their demanding schedules and their complete insignificance in the corporate decision-making process. Dissenters of the change appear to be in the minority, however, with supporters inclining avid holiday deal-seekers, retail chain executives, and proponents of the impending Great American Marxist-Leninist Uprising looking for one final straw to break the capitalist’s back. 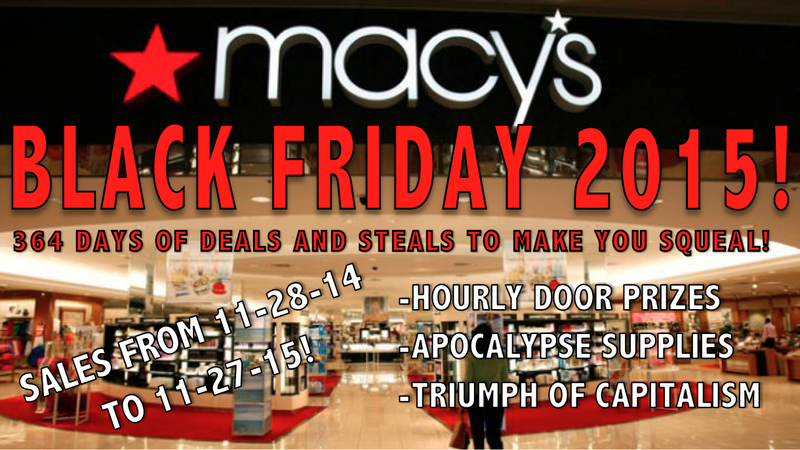 An advertisement from Macy’s department stores, outlining the main draws of the early start of Black Friday 2015. Economists have predicted next year’s hot-ticket goods and gadgets to be those most desirable in the event of a major environmental cataclysm. These include bottled water, small firearms, scented candles, VHS copies of An Inconvenient Truth, and the iPhone 9. GUSTIE CHATS: What Are We Thankful For?